The underlying theme of Bible prophecy is the destruction and restoration of Jerusalem, which in former times was known as the city where Jehovah exclusively caused his name to reside. Because of Jerusalem’s prominence as the center of true worship and the capitol of Jehovah’s earthly kingdom it also has prophetic significance in the Christian arrangement, relative to the coming of Christ. That is made all the more apparent when we consider, for example, the Christian prophets wrote of a heavenly Jerusalem and a New Jerusalem. Not coincidentally, Jerusalem was where Christ terminated his earthly mission after having inspected his Father’s temple for the final time. It is also where Christianity originated – the holy spirit having been poured out upon the original disciples in an upper room in the heart of the holy city. And it appears that the even though the apostles were all from the area of Galilee north of Judea, after Jesus returned to heaven they permanently relocated to Jerusalem – making the city the unofficial earthly headquarters of Christ’s congregation. In the manner of the Hebrew prophets before him, Jesus also spoke of Jerusalem in symbolic terms when he foretold that the city would be trampled on by the nations and that a “disgusting thing” would violate its holy place. True, the actual city and temple were quite literally demolished by the Roman army in 70 C.E. ; but it is also apparent that Jesus used that localized tragedy as a pattern for events that are destined to occur during the conclusion of the global system when he stated that the desolation of Jerusalem would occur in the context of the worst time of distress the world will ever experience – calling it, the great tribulation. With these facts in mind consider the opening words of the prophecy in the 22nd chapter of Isaiah. It is noteworthy that there are aspects of Isaiah’s depiction of the siege of Jerusalem that do not line up with the historical accounts. 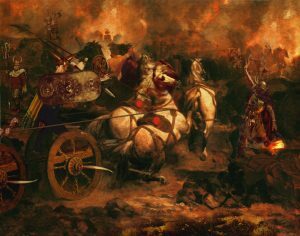 For example, when king Sennacherib threatened Jerusalem and demanded that the king of Judea submit to Assyria God simply slew the Assyrian army as they slept – there was no siege. And later when Nebuchadnezzar laid siege to Jerusalem he certainly slew many with the sword and the only hope of survival was if the Jews surrendered to the Babylonians. Running away was not an option. It is evident that the prophecy speaks to something other than the ancient city. Really, throughout the prophecy of Isaiah God speaks to his people in the Christian era at the time of the conclusion through the ancient setting. Therefore, the “boisterous city” and “exultant town” that comes under Jehovah’s judgment is the Christian congregation. And like ancient Jerusalem, the modern Watchtower Society is the city-like capitol of Jehovah’s earthly organization. The Christian congregation of Jehovah’s Witnesses takes to itself the biblical description of being “noisy with men.” The Watchtower even claims that Jehovah’s Witnesses live in a spiritual paradise, this in spite of thousands of cases of pedophilia. In spite of the turmoil within, who can deny that the leadership constantly exults the organization? It is this “exultant town” that is destined to come under siege in the near future. As Jehovah’s Witnesses well know, it is a grave offense against God to stumble a fellow believer. Jesus said that it would be far better to hang a millstone around one’s neck and be plunged into the heart of the open sea then to be guilty of stumbling one of God’s little ones. That is because to stumble another would cause them to lose their life. Although the leadership of the organization has never taken any responsibility for having stumbled large numbers of Jehovah’s Witnesses over the decades, the facts speak for themselves. For example, as is well known, back in the late 60’s the Watchtower Society and some of her traveling representatives began to cultivate the expectation among Jehovah’s Witnesses that the system would end in 1975. Obviously, though, the world did not end then. But in the years following that fiasco a substantial number of Jehovah’s Witnesses became disillusioned. Many subsequently left the faith. They were stumbled. But up to this present moment that Watchtower Society has promoted an even greater falsehood – the artfully contrived false story that an invisible parousia began in 1914 and that virtually all of Jehovah’s judgments were accomplished back during World War One. As a consequence, Jehovah’s Witnesses have no expectation of coming under divine judgment in the future. This stands as a potential faith-killer for virtually all of Jehovah’s Witnesses when the real parousia commences. That is because even now any who question or reject the Society’s 1914 operation of error are “slain,” as it were – cast out as mentally diseased apostates. In that way Jehovah’s Witnesses are imprisoned to falsehood. They are captives of a concept – as one ex-JW worded it. And when Christ comes for the inspection it will become manifest that Jehovah’s Witnesses are “prisoners” of their own unfounded beliefs. No doubt, too, that is why Jesus foretold that many would be stumbled. In that way, then, the Watchtower Society will become guilty of slaying many without the sword. Yes, many of Jehovah’s Witnesses are going to become as those dead in battle, when their faith in the infallible faithful slave goes bust! Back in the 2nd chapter of Isaiah Jehovah addressed himself to the dictators of his people who had not cared for the widows or fatherless boys. Nevertheless, God expressed his desire to set matters straight with his erring people, so that their sins, though red as scarlet, might become white as snow. So, the “dictators” who flee the besieged “town” are the elders of Christ’s congregation. Appropriately, the New World Translation uses the word “dictators” – as opposed to “leaders,” as most other translations render the verse. Considering that elders merely speak and teach whatever the Society dictates they must, what could any elder possibly say to their local flock to explain how the faithful slave got 1914 wrong? They will flee in that they will be completely ineffective in their attempts to fight in behalf of the disgraced Society. “Dictators” is indeed an apt title for Jehovah’s Witness elders – particularly the leadership. That is because they dictate virtually every aspect of the lives of Jehovah’s Witnesses. To illustrate the point, in recent decades Bethel and various satellite branches have become popular touring sites. 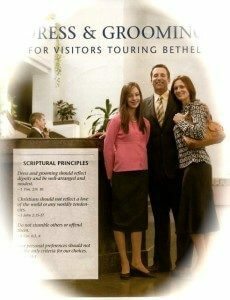 But instead of allowing each person to decide what is appropriate dress the Watchtower has produced a four-page pamphlet with graphics illustrating what is considered proper dress and grooming for persons touring their facility. (Downloadable PDF below) In other words, Bethel dictates exactly what Jehovah’s Witnesses are not to wear and how exactly not to appear. Bethel elders ought to more closely consider the letter of James, which condemns the hypocrisy of Christians who would honor a well-dressed man and dishonor a poor man dressed in filthy clothing. Presumably, if Jesus Christ himself were to appear in his traditional garb he would be prevented from touring any Bethel facility. Interestingly, the prophecy of Isaiah under consideration here bears certain similarities to Jesus’ prophecy. Note that Jesus instructed his disciples not to come down from the rooftops to fetch their belongings. In Isaiah Jehovah specifically addresses himself to those who have rushed to their housetops to see what all the commotion is about. Secondly, Jesus commanded his followers to flee. Isaiah depicts the leaders abandoning the doomed city and running far away. According to the augur of Bethel the holy place that is destined for desolation during the conclusion of the system of things is Christendom. That is because it is inconceivable to them that God would ever demolish the Watchtower Society. They further reason that Jerusalem was not really a holy place to Christ and the original disciples. That, of course, is simply not true. The apostles regularly taught in the temple in imitation of their teacher, apparently up until the time they fled the city when the disgusting thing finally appeared. Besides, why would the prophets weep over the desolation of Christendom? Isaiah wept, “over the despoiling of the daughter of my people.” So, it is God’s people who are destined to be treaded down, confounded and confused. Jehovah’s Witnesses will inevitably be confounded and confused at the coming of Christ. That is because Jehovah’s Witnesses are absolutely convinced that Christ has already come. 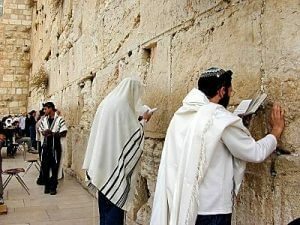 The Society’s prophets have cleverly built up a symbolic wall that they suppose will protect them from God’s judgment. 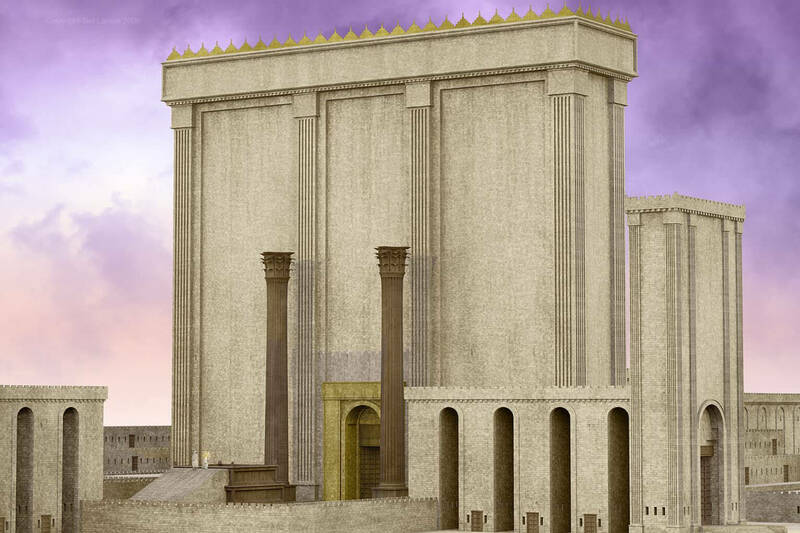 They imagine that Christ long ago inspected the spiritual temple and gave them God’s unqualified approval. The Watchtower’s 1914 teaching is unquestionably the very foundation of the organization. In the minds of millions of Jehovah’s Witnesses it stands as a rock-solid fortress of truth – unassailable by outside enemies. They have no inkling that “the demolisher of the wall” is about to be dispatched. For nearly a century now the Watchtower has been harking back to 1914 and the Great War that began then. Jehovah’s Witnesses have been declaring to the world that the four horsemen of the Apocalypse have been on the gallop ever since. But according to prophecy, the sword, famine and pestilence are the means by which Jehovah enters into judgment with those inhabiting “Jerusalem.” That theme is repeated throughout the prophets. Yet, according to the Watchtower the judgment of antitypical Jerusalem is a future event. Ironically, the world now stands at the brink of global financial collapse and nuclear war, famine and pandemics on a scale that will dwarf the events of the 1914-1918 era – and Bethel’s watchmen have apparently taken no note. That is not to imply that the Watchtower Society and Jehovah’s Witnesses are not Jehovah’s earthly organization, only that they are blind – as the prophecies also indicate God’s servants would be at the time of Christ’s inspection. Just as old Jerusalem was the City of David because it produced the messianic king, the Watchtower has produced a generation of anointed persons, both faithful and unfaithful, who comprise a spiritual house of God that Christ will yet inspect. His inspection is set in the context of war. So it is, the next span of verses in the 22nd chapter of Isaiah speak to the coming global war and the collapse of the city-like organization that comes under Christ’s inspection. Although God has heretofore led and protected the modern-day City of David and has used it to accomplish his purpose, he will at some point abandon it. In that way those who have looked to the Society as God’s earthly mouthpiece will no longer see the grand maker of it. To be sure, the removal of the physical organization, described above, is a necessary prelude to the establishment of the spiritual kingdom of Christ. The return of Jesus Christ will be a monumental event. His coming down to this earth will coincide with world war, widespread food shortages, great earthquakes and global pandemics. The judgment of the house of God will then take place. Jesus’ presence will place a unique test upon Jehovah’s Witnesses, for the obvious reason that Jehovah’s Witnesses ardently believe that Jesus returned long ago and has already accomplished the judgments outlined in prophecy. The future coming of Christ will confront Jehovah’s Witnesses with the unsettling reality that not only have they been duped into merely believing a falsehood, but virtually every publisher and pioneer has personally participated in a campaign to convince the world of what amounts to a fraud. It is a very serious thing to speak and teach lies in the name of Jehovah. The prophecy of Joel similarly calls upon the priests of Jehovah to dress in sackcloth and beseech Jehovah for aid. However, given the intransigence on the part of the leadership of the Watchtower Society up until now – as regards their stubborn refusal to discard the 1914 operation of error – it is doubtful that they will do so even when the sign of Christ overwhelmingly displays itself in the near future. Instead of mourning over the reproach their lies will have brought upon God’s name and the many Christians their lies will ultimately stumble, those who have idolized the Watchtower Society and demanded unquestioning obedience to its every dictate, will likely refuse to acknowledge their error and repent of their idolatry. In reality, they will refuse to accept Christ when he comes, and as a consequence, their error will not be atoned for. They will die!